The Osun State Governor, Rauf Aregbesola, has promised to pay the salaries of workers in the state before the end of June. Aregbesola made this promise in a statement released in Osogbo on Sunday by the Director, Bureau of Communications and Strategy, Mr Semiu Okanlawon. The statement read: “Before the end of June, workers would be paid their salaries”. The Governor stated that he had a great dream for the state, explaining that he desire to achieve the dream had contributed to why he was in hurry to begin programmes which had earned him applause even outside the country. “The dream has not gone awry and it is a clear vision that Osun must be on its feet, self-reliant and be a reference point in Nigeria. The race to ensure development within the first term of Aregbesola was informed by the fear of what is happening now. 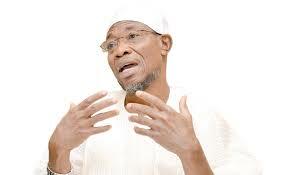 “Aregbesola wanted an Osun State that is self-reliant. That Osun State, almost two decades after its creation, could not boast of tax-paying companies speak volume about the magnitude of the works that awaited the Aregbesola administration. “But he did not shy away from this task of industrialisation. Within his first term, his government had caused investors to bring up companies, such as the Omoluabi Garment Factory, Osogbo and Adulawo/RLG Technology Company in Ilesa. “Just last month, a leading telephone line company, Airtel, came to establish partnership with the Adulawo/RLG Company. These are aside the various agro-allied companies which have benefited from the growth schemes of the Aregbesola administration throughout the state. “The government has also commenced aggressive drive for the development of the solid mineral sector with the signing of a Memorandum of Understanding with an Australian mining firm, Andalusia Mining Industry. “It was in the same vein that the idea of an airport for aircraft maintenance was conceived. ”Only a lazy administration would accept the tag of Osun State as a ‘civil servant’ state as excuse for not developing initiatives for industrialisation. ”To accept that our state must continue to survive on the meagre inflow through what goes to the civil servants alone is to accept that we would continue to depend on external forces for our survival,” the statement further read. Workers in the state are being owed seven months salary as it was not stated whether the backlogs would be paid in full or it would be in part.